I love to cook, but I have never really ventured into traditional Polish cooking because: 1. It is incredibly time-consuming, 2. It is incredibly fattening, 3. My mom and my sister have always taken care of making the traditional meals. But then my friend Namrata asked me if we could make pierogi (Polish dumplings) and since I don’t go home much these days I had a craving, so I told her sure…I had never made pierogi before, nor had I really bothered to observe when mom and Joanna do it (usually I’m in the kitchen stealing dough or cooked pierogi), so I was a little apprehensive on Sunday morning. But, 5 hours, 2 bloody hands, teary onion eyes later we were feasting on the most delicious little dumplings ever and I was incredibly proud of myself for being able to make them. Cook the potatoes the night/day before you make the pierogi and let them dry out in the fridge overnight. When they are ready, mince or grate them (we used a normal cheese grater) and do the same with the feta. There should be roughly the same amount of grated feta and grated potatoes. Cook the onions and after letting them cool, add to the potato and feta mix and then season. Don’t add too much salt because the feta will be salty. Leave the mix on the side. If you don’t have a food processor with a dough hook prepare to spend the next 30 minutes making your muscles ache while you roll the dough. Once the dough is ready, divide it up, roll it out thin and prepare to make the individual pierogi. TWO very important things here: 1. 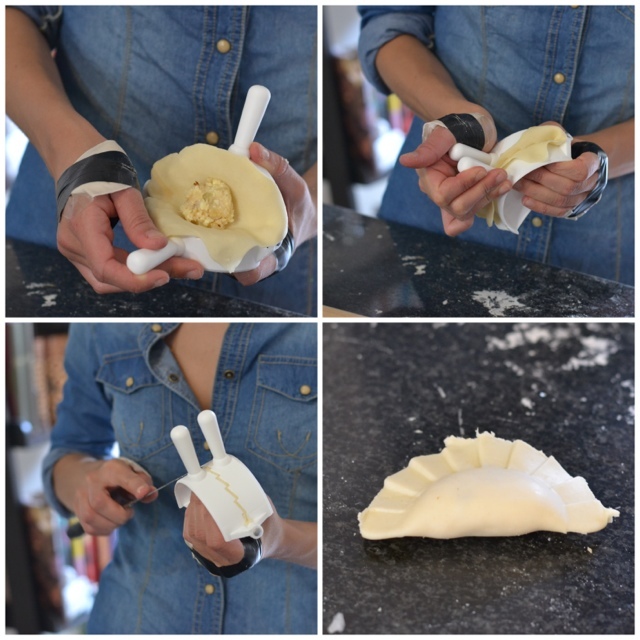 Make sure you own a little dumpling press (can be bought at Pick ‘n Pay) 2. 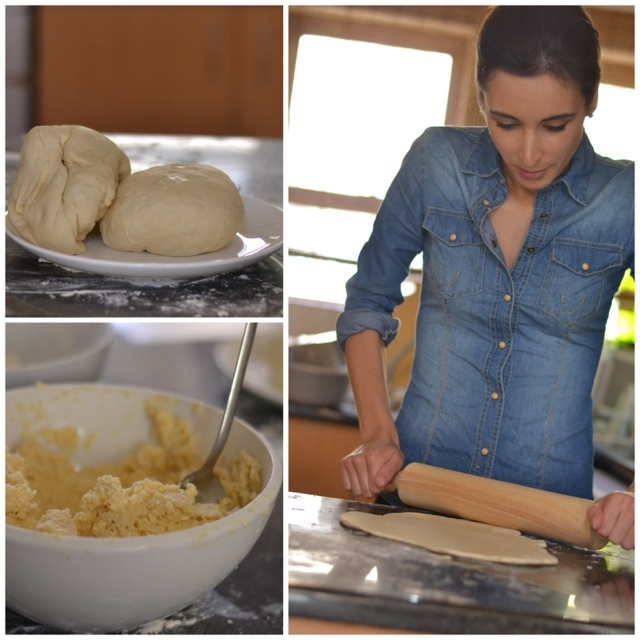 Don’t use a wine glass to cut out the dough or your hands might end up looking like mine. Try and make the dough as thin as possible for each pierog, but not so thin that it will break. Also don’t put too much filling inside each one because when you close the press it will get inside the edge bits and then it won’t stick properly. Other than that, prepare to spend the next 3 hours sticking – unless you have a whole army of people to help you. Once the pierogi are ready, boil a big pot of water, add lots of salt and then cook them. Mandy was our chief cooker and she determined about 3.5 minutes for 6 small pierogi. When you take them out try get the excess water off as much as possible. DON’T put them on top of one another or they will stick. Once you have enough to feed people, heat up a pan, fry the cooked pierogi till they go golden brown and top them with some fried onion and bacon. Serve with dill and sour cream. Then go for a three hour run. You’re welcome. Ouch, so sorry about your hands! 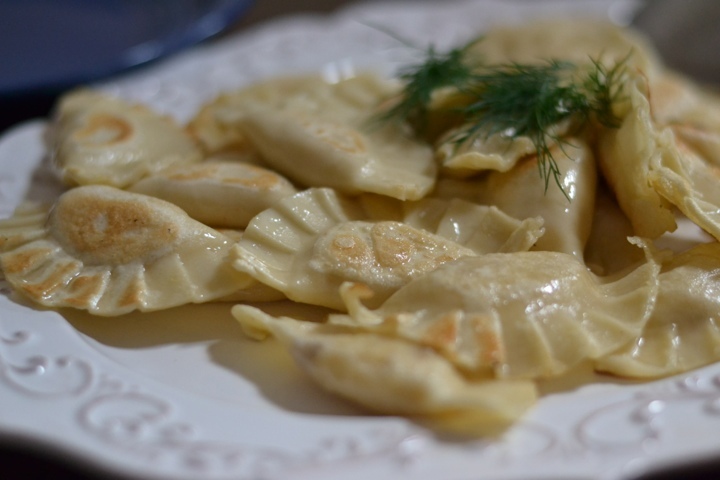 I’ve never had fresh pierogi but I’m SO excited to try thanks to this post because yours look lighter and prettier – pretty totally makes things taste better! Definitely buying the press. I will invite myself over to my sisters and then share with her! Great suggestions! Thank you – they really were. Unlike the Polish donuts I tried to make. I absolutely love it when you post recipes! Recipe book one day?